IEM is officially hitting the Windy City, announcing a multi-year deal with the United Center and Wintrust Arena to make Chicago the new home of IEM starting this year. IEM will move from Oakland to Wintrust Arena this year, and then United Center for 2019 and 2020. As part of the yearly IEM competition together with Katowice, Sydney and Shanghai, IEM Chicago will feature the world’s best 16 teams in Counter-Strike: Global Offensive who will contend for a prize pool of $250,000 from Nov. 10-11, with group stages running Nov. 6-9. IEM Chicago 2018 will be also part of the Intel Grand Slam, which will award a $1,000,000 bonus prize for the first team to win four of the last ten major CS:GO events organized by ESL and DreamHack. The first eight invites for the event are set to include Astralis, FaZe Clan, Team Liquid, mousesports, MIBR, NRG Esports, Renegades and BIG. 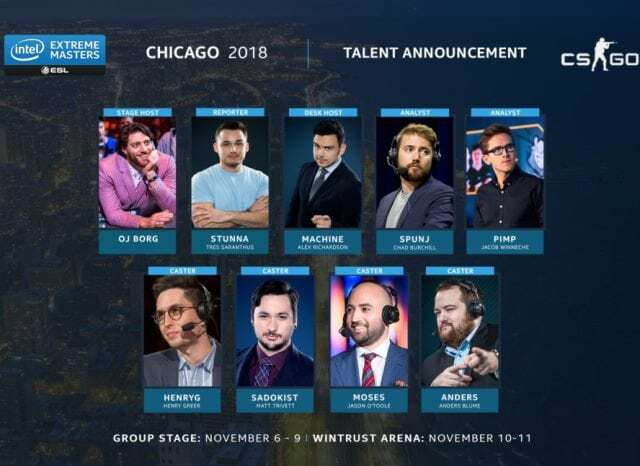 Calling the action in Chicago will be OJ Borg as stage host, Machine as deck host, reporter Stunna, analysts SPUNJ and Pimp, and casters HenryG, Sadokist, Moses and Anders.